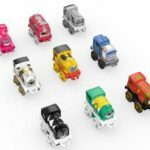 In a rather bizarre turn of events, the company behind the Thomas the Tank Engine and Friends toy-line has announced a cross brand promotion with Saban’s Power Rangers. Thomas trains themed after characters from the first and second season of Mighty Morphin Power Rangers will see release though currently, there’s no word on release date and price point but stay tuned and we’ll bring more up to date information as it’s made available. Well we certainly do! 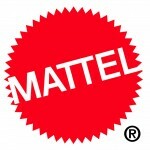 And it would seem that Mattel does as well! 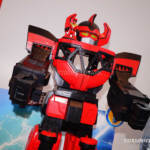 The inaugural releases in the company’s Mighty Morphin Power Rangers Imaginext line have begun to hit retail in recent weeks and we’ve gotten our hands on one such set for gallery & review. Imaginext Goldar & Rita Repulsa! This set takes the mighty Sorceress Rita Repulsa and shrinks her down while taking her most famous general and making that monster grow! Goldar is a simplistic but large and imposing toy. Featuring the pattented Imaginext Power Pad gimmick, Goldar can unleash his mighty wings or swing his sword! While Rita can mount behind Goldar’s head with her Magical Staff. While aimed at children (ages 3-8) this set will undoubtedly appeal to adult collectors and fans of Mighty Morphin Power Rangers for it’s big play value. We’ve attached a selection of images to the front page but you can check out over 50 images of Imaginext Goldar & Rita Repulsa by clicking “Discuss on the TokuNation Forums” at the bottom of this post! The first piece of Megaforce merchandise has apparently hit retail! 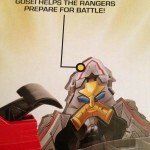 Reviewer HAVortexDude has picked up this Hot Wheels Action Set and provided an excellent first look at 20th Anniversary toys, including the first glimpse of the character “Gosei” from the sets’ box art. 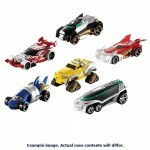 A pre-order page on the Entertainment Earth website has given us the official images for the forthcoming Hot Wheels Power Rangers Megaforce vehicles! First revealed by Mattel earlier this year at SDCC, these 1:64 scale diecast cars are modelled after the zords to be featured in the series and due for release in January 2013. Check out the full sized image after the jump!